We conduct the Fearless Presentations ® class and presentation seminar in Houston, Texas at The Double Tree Hotel by Hilton located at Houston - 15747 JFK Boulevard, Houston, TX 77032 US. This office opens at 8:30 AM, registration begins at 8:45 AM, and the course takes place from 9:00 AM to 4:00 PM both days with a one-hour break for lunch around Noon. To register for any of the public speaking classes or workshops listed below, just click the appropriate link. If you need additional information before registering for a class, return to the public speaking class locations page and complete the form at the bottom of the page. Houston, TX presentation workshops are scheduled about once every four months. I had a fantastic time teaching a custom presentation skills class in Houston, Texas for QuestIRA last week. Quest is a really unique company that helps their clients establish and maintain self-directed IRA's without a broker. So, a big part of their organization deals with educating their clients so that the clients can make good financial decisions. Many of their clients have moved their IRA funds out of the stock market and into asset-based investments like real estate, commercial property, business loans, and precious metals. One of the things that made this class unique was that we had both of the founders of the company, who deliver three to five presentations a week, along with new associates who have never delivered a speech at all. Because we focused on a few basic techniques and moved quickly into some of our more advanced ideas on designing custom presentations, though, everyone was satisfied with the results. 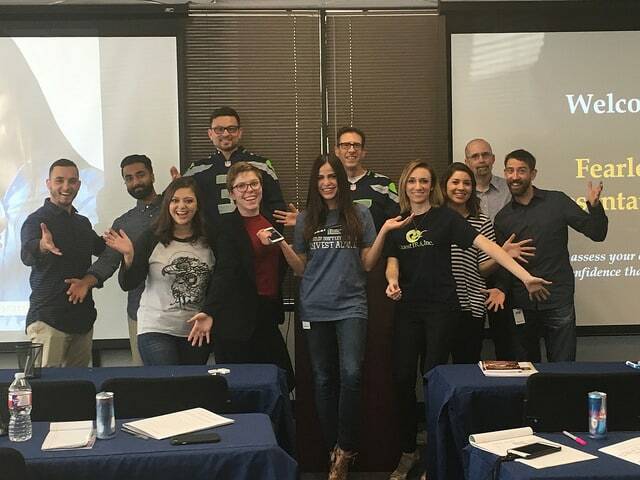 I led a very fun and interesting Fearless Presentations® public speaking class in Houston, Texas last week, and because the group was a little smaller than the normal Houston class, we were able to cover a lot of additional content for the participants! As many of you may know, we like to keep the class size for a presentation seminar at around seven to 10 people per workshop, because we have found that the class size is small enough so that every participant get individual coaching from the instructor but large enough that they actually get practice speaking in front of an audience. So Fearless Presentations® is an excellent way to get the best of both worlds in presentation coaching. 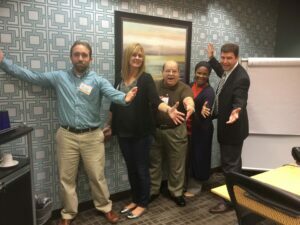 Since the Houston seminar had a couple fewer participants, though, we were able to really delve into some of the finer points of presentation skills. One of the sessions that the group really enjoyed was the session about how each speaker has specific strengths and weaknesses, but how professional speakers maximize their strengths and minimize their weaknesses. Statoil, in Houston Texas learned that stories come in all shapes and sizes. We like them because they can be very inspirational or have a very solid moral message. They are the absolute best way to establish a positive rapport with your audience. It can help make your speech memorable. Most often, people will remember a good example or story more than they remember data, facts, or figures. All of us share commons struggles, challenges, setbacks, and failures. We also share common accomplishments, successes, and persistence. These are most effectively communicated through stories and examples that help us bond with our audience. So, you have a great story to tell, so tell it in your next presentation. The In-House Fearless Presentations ® Workshop can teach you how to properly insert a story into your next speech or presentation.